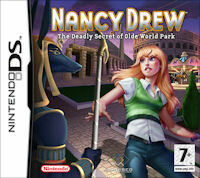 Famous teen detective Nancy Drew makes her debut on the Nintendo DS in the forthcoming Nancy Drew and The Deadly Secret of Olde World Park, a new game for the Nintendo DS from Majesco Entertainment Company. She must unravel the mystery of missing billionaire, Thaddeus Belmont. On the eve of the opening of his new multimillion-dollar theme park, Olde World, Belmont has disappeared, and Nancy is called in to investigate. You assume the role of the teenage super sleuth and use Nancy’s detective skills to collect clues, decipher puzzles, follow suspects, sneak into areas and much more as you progress through 15 increasingly-difficult chapters. The unique graphic novel format of the game pays homage to the classic book series that introduced Nancy Drew to the world. You use the touch screen to engage in conversation with witnesses and suspects to learn critical information for the case. You can choose the tone of the conversation, and even bribe a character if necessary. You use the stylus to access maps, inventory and tasks in Nancy’s Clue Journal. Nancy Drew and the Deadly Secret of Olde World scheduled for worldwide release for Nintendo DS later this year.